I think it's pretty safe to say that Castle Creations Inc. makes the most successful speed running / drag racing ESCs on the market right now. However, just like any other piece of high performance machinery, you need a certain amount of skill to get the most of them without destroying stuff. In this post, I'll talk about one of the most common "rookie mistakes" that I see out there and give a few tips to help you avoid cooking your very expensive hardware. So, you've just completed your dream build. The car is lined up and ready to have two sticks of LiPo dynamite propel your Castle XLX ESC and GINORMOUS custom-built motor to a new personal best. Your heart is beating at 180 beats per minute and you pause to wipe a bead of sweat from your brow. Your mouth is a little dry and it feel like time is nearly standing still. This is it. Time to squeeze the trigger and "Get dat speedah!" You count backwards in your head. "3..........2...................1............................Go!" Your finger instinctive clenches and over 13 electrical horsepower are unleashed into the world in one glorious rush..... and all heck breaks loose in your car. You smell the acrid stench of char and you break into a sprint in an attempt to save your precious work. Unfortunately, this scene has played itself out countless times in the speed running / drag racing communities. It's usually followed by an angry post about a "bad" ESC, and a rant about how much money was spent/lost. But then the veterans step in and ask the question that quiets the storm. "Can we see your logs?" Now imagine suddenly unleashing enough energy to power 8 homes in a few microseconds.... inside of a device smaller than a soda can. What would that look like? A bolt of lightning in a bottle, maybe? That's the problem. The solution is simple: CALM DOWN!!! If you think back to the original speed run videos on YouTube that got a lot of us into the hobby, guys were always bragging about only using 1/3 or 1/2 throttle on their 100 mph runs. Why? Because they all figured out that VERY bad things happen if you apply too much throttle too quickly. Put bluntly, no one in their right mind should be lining up and just dumping the throttle on a speed or drag run. That's just an easy way to destroy a lot of good hardware. The veterans are actually very skilled at knowing exactly how much throttle they can safely lay down in a run without spinning out or breaking things. Some guys have "full throttle" cars, but others can only use 2/3, 1/2, or even 1/3 safely depending on their setup... but they probably won't tell you that. And why would they? You're the competition. My advice? Take some "quality time" with just your radio and "visualize" your run. A typical speed run last ~10 seconds, but a drag run is just 2 seconds (or less). Close your eyes and practice doing a series of smooth full trigger pulls that last about the length of your run. Then do it again, but hitting a level less than 100%. Start with ~75% then do ~50% and ~25%. Do this over and over until it feels like second nature. Then, go out for a practice session on REDUCED POWER and practice hitting your mark with your car. This is how you build your technique so you are truly ready to handle your car. Once you can reliably hit your throttle marks, THEN start practicing with full power, but gradually increasing your max trigger pull with every run (and checking your data logs to see how you REALLY did). This is how you learn your car and what it can actually handle. It also lets you find and fix problems in your system before "race day". This is where you learn how much power your tires can take before spinning out or if your gearing matches your speed goals. You may find that you need a bigger (or smaller) pinion, you have a traction problem with your tires, or you have a weak driveshaft that can only handle 2/3 throttle. All of this helps to ensure that both you and your car are ready when it counts. I know.... this sounds like a lot of work. It is! But this is what the really fast guys do.... that they almost never tell you about. They just sit back and watch the newbies blow up their gear on "Race Day" and smile to themselves. Disclaimer: The views and opinions expressed in this blog are those of the authors and do not necessarily reflect the official policy or position of Castle Creations Inc. The authors, blog and/or Company are not to be held responsible for misuse, reuse, recycled and cited and/or uncited copies of content within this blog by others. One of the most frequent questions I get asked is “How can I make my car Really FAST?! !” This is usually followed by a really vague description of the ride in question and a wish list of shiny new parts to be shoehorned into the poor little car. The problem is that many guys do not realize that there are several paths that can get you to some really nice speeds for speed runners (and drag racers). Unfortunately, you really need to have a decent understanding of each of these paths before you can pick the right direction for your particular build. Again, there is no one right path, but if you don’t appreciate what makes each one unique, you can actually pick hardware that works against itself and ultimately wastes a lot of time and money and can actually make you slower. Before I begin, it’s important to point out that just throwing the biggest or most expensive hardware into a car rarely results in a fast RC. You really have to invest a little time and think about how all the pieces work together and tune your ride for your goal. You also have to be honest with yourself about your goals and your skill level as a driver. For example, if you are just getting into speed running or drag racing, building a Mamba XL X powered, 8S, 1/8 scale (ROSSA 808 class) world record contender may not be your best first move. I’ll talk about good starter platforms in a later post, but for now let’s just say that an “inexpensive” platform that you can easily fix after a crash (because you WILL crash) might be a better addition to your Christmas List. In my experience, new speed builders usually fall into one of 3 basic categories: “Torque Monsters”, “KV Kings”, and “Killa-Volters”. Each category has its own strengths and weaknesses, but the fastest guys try to take lessons from each group and apply them to their builds where they best fit. Just keep in mind, NEVER EVER COPY SOMEONE ELSE’S SETUP. Even though two cars may look the same, there may be some big differences under the hood, especially in ESC tuning. Copying another builder’s setup without understanding the decisions they’ve made is a great way to destroy expensive hardware (and it makes you look like a jerk). Just sayin’. We all know that guy who insists on stuffing the absolute biggest motor and ESC possible into their cars, whether it makes sense or not. This is the guy who puts a Castle 15-series motor and Mamba XL X ESC powered by 8S LiPos in a 1/10 scale touring car…. just because he could. Sometimes this makes perfect sense….., but sometimes it does not. You see, very large brushless motors typically have pretty low KV ratings, meaning they are designed to produce their peak power at fairly low RPMs. Since Mechanical Power = Torque * RPMs, this means that the motors can produce VERY high levels of torque at pretty low RPMs, which is AWESOME for drag racers, big monster trucks, rock crawlers, or wheelie popping bashers. The problem for speed runners is that you really need to generate really, really high RPMs at the wheels to achieve high speeds. For many cars, this means running impossibly low gear ratios or extremely high battery voltages to get real speed. What usually ends up happening is the motor pulls so much current trying to just get the car rolling that the system voltage sags to a really low level. The motor then maxes out at an RPM much lower than the builder intended… and you get a “slow” run. Better batteries and beefier ESCs can greatly improve the top speeds in these cars, but this can put a LOT of strain on the system causing lots of random things to break. (More on this later). 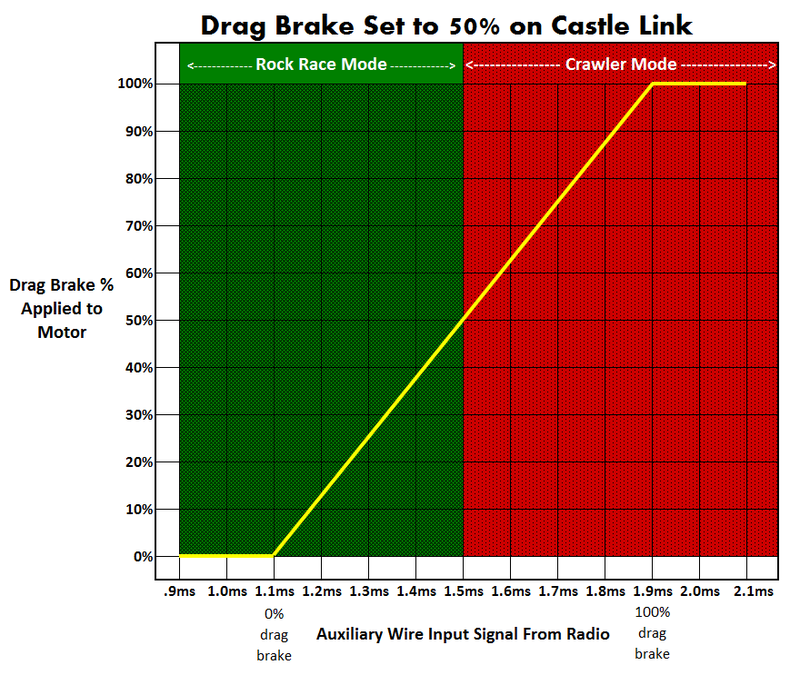 Torque Monsters can optimize their cars by reviewing their Castle Link data logs and watching how the voltage falls during the car’s power pull and how that turns into motor RPMs (and system temps). If the voltage falls off extremely quickly (maybe even below the LiPo cutoff level), but you see slow acceleration, your car is probably waaaaay over-geared. Try backing off some in your gearing and see if this lets your motor spool up faster. On the flip-side, if your motor spins up to max RPM extremely quickly and you see little or no voltage sag during your power pull, you are probably waaaaay under-geared. Try slowly stepping up your gearing until you find a balance of current draw, motor & ESC temps, and acceleration that you can live with. And if you see wheel spin, try adding weight (if your rules allow it) to help the car “hook up” better. Even though adding weight to make a car faster sounds a little crazy, it’s all about having enough weight on the wheels to maintain traction, at least until you get fast enough to start generating downforce… but that’s a topic for another day. Lastly, large, low-KV motors are usually set up to pull extremely high current loads, so you need to check your motor and ESC temperatures after each run with a temp probe AND be sure to check your data logs to make sure your system remains healthy. Pay particularly close attention to your logged current levels. Exceeding the recommended output of your batteries could result in a LiPo fire or explosion. Also, ripple voltage should be in the 5-10% of system voltage range. For example, a 6S (25V) setup should ideally have ripple levels of 1.2-2.5V (or less). If your ripple voltage is in the 10-20% range, you are in the danger zone and should seriously consider upgrading to higher C-rated batteries or adding an external Cap Pack (or both). Ripple levels higher than 20% are almost guaranteed to eventually blow up your ESC. Some guys think that the answer to every speed problem is to add a higher KV motor. Sometimes this is just the ticket to unlock your car’s hidden potential ….but just because you can install a 7700kv motor doesn’t mean that you should. Let’s start by telling a little secret about motors that a lot of guys don’t realize. Most motors of a given series or “can size” from a given manufacturer are rated at about the same max output power level, regardless of KV rating. This is partially because the size of the “can” limits the amount of waste heat the motor can dump into the environment. This and the overall efficiency of the motor limit the max power you can safely extract from that motor without cooking its internal components. Period. Again, since Mechanical Power = Torque * RPMs, this means that a Castle 1406 3800kv motor and a 1406 7700kv motor will both produce about the same amount of output power, but the 3800kv motor will have an efficient power-band that produces more torque over a lower RPM range and the 7700kv motor’s power-band will produce less torque but at a higher RPM range. Why would motor makers do this? Well, it helps them to offer motor options compatible with a wide range of RC vehicles and applications. For example, a rock crawler needs lots of wheel torque at low RPMs, but a 1/10 scale on-road racer may work better with a high RPM, low torque setup. Without getting too technical, Brushless motors for RC cars are typically “in-runner” designs that contain several coils of wire in the stationary can body (stator) that with powerful magnets on the rotating assembly (rotor) to produce driving force. Lower KV motors use a small number of turns of thick wire that makes a lot of torque, but doesn’t want to spin very quickly. On the other hand, high KV motors use more turns of thinner wire which doesn’t make as much torque, but wants to accelerate to much higher RPMs (at a given voltage). The interesting thing is that since brushless motors must be commanded with power pulses to turn every fraction of a turn (12 pulses per turn for 3-phase 4-pole motors), a lower KV 1406 motor’s slow, powerful pulses will average out to about the same average power as the higher KV 1406 motors more rapid, but less torquey pulses, resulting in the ESC feeling the same overall load with either motor and both motors producing the same levels of waste heat. Blindly throwing a crazy-high KV motor into a drag or speed run car could result in the motor trying to produce high torque levels at low RPMs, which is the exact opposite of what these motors were designed for. In the Castle Link data logs, this would look just like the Torque Monster’s over-geared case. The motor would draw a lot of current, but not be able to achieve its spec’d rpm range. Unfortunately, these motors are not built to handle very large current loads, so repeated abuse like this could cause the motor to overheat and blow itself out. Also, if you exceed the suggested voltage for that motor you could exceed the max rpm rating for your motor’s rotor, causing it to physically rip apart. For example, a 1406 7700kv motor on 4S could easily spin up to over 100k rpm, voiding your warranty and causing you to have a very bad day as it shreds its innards. Successful KV Kings can tune their setups by figuring out a comfortable motor RPM to rev to (let’s just say 80-90% the max RPM for a given voltage) and finding the gear combination that lets the motor achieve this level while keeping the motor and ESC below 160-180 deg. F (70-80 deg. C). Also, running a Sensored motor in these applications should help minimize the current draw at startup which should also help control motor & ESC temps. If you do all this and you are still not able to reach your speed goals, you should really consider stepping up to a larger motor class before resorting to options like overly aggressive ESC timing. Castle calls its ESC timing settings C.H.E.A.T. for a reason. Yes, it can fool a motor into running even faster (almost like adding another few teeth to your pinion), but this comes at a cost of efficiency. Less efficiency = more waste heat = more blown motors and ESCs. There’s a rule in electronics called Ohm’s Law, which says that the current that will flow through a given electrical system actually increases with your system voltage (Current = Voltage / Resistance). This means that a 6S system will actually pull twice the current as the exact same system on 3S. So, a system that pulls ~100 Amps on 3S will usually pull ~200 Amps on 6S…. and ~267Amps 8S. Since Elec Power = Current * Voltage, that means that the actual power increase from increasing cell count is a LOT more!!! So, doubling system voltage can actually give you 4X more power (assuming your system can handle the load)!!!! These estimates are actually kind of low for Castle Products. Mamba XL-Class ESCs routinely pull 400+ Amps in real-world 8S setups. This is probably where you say to yourself, “this Killa-Volter thing sounds AWESOME!!! What’s the catch?” Well, there are some downsides. The first is that increasing power like this put a LOT more strain on your system. I LITERALLY melted my slipper clutch on one of my first 6S speed runs. (https://youtu.be/PmuJ0ERrk90) Many guys also find that they strip all their plastic gears and start snapping driveline components. You will also put a much greater load on your batteries and ESC, so you really need to review your data logs to make sure that your voltage sag, ripple voltage, and system temps aren’t creeping into the danger-zone. As long as you follow the same tuning steps that I described earlier and you should be ok. Just start off conservatively and work your way up. Trying to make huge leaps with overly aggressive tuning is a great way to blow up your system, so try to think things through before making drastic changes. What is the right Castle Sensored 1406 motor and Max Power for your vehicle? During the initial track-tests of the Castle 1406 Sensored motors, Castle engineers quickly realized that these motors were much faster and provided more torque than was expected by a typical racer. Repeated testing showed that decreasing the ‘max power setting’ resulted in a ‘feel’ that closely matched existing ROAR-style 2-pole motors used in modified racing. Further lab testing using a dynamometer (dyno) compared several standard 2-pole, ROAR-style motors under load to the new Sensored 1406 series motors. This data was then verified by a professional racer to ensure the ‘feel’ was correct. 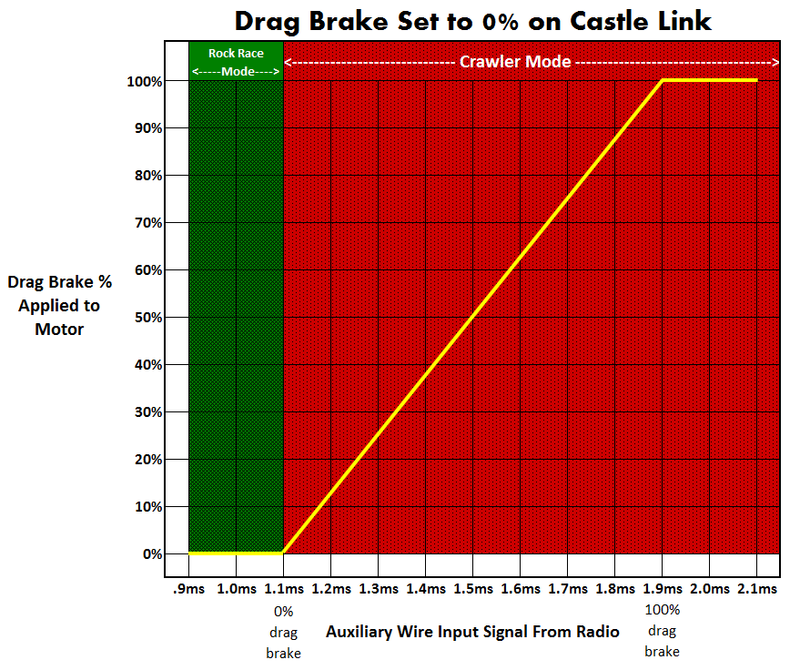 These tests produced the following chart to help you pick the right Castle Sensored 1406 motor and max power for your vehicle. ROAR-style 2-pole motors produce different speeds for a given turn-count depending on the manufacturer and series. This testing averaged data from several top manufacturers’ motors with the same gearing to create a baseline. Modification to the suggested max power below or to the gearing may be necessary to fit your personal preference. This is not a motor timing adjustment or a boost mode, this is simply the ESC limiting the maximum amount of throttle to the motor. In other words, if you want our 1406-4600Kv to feel like a 9.5T motor, this would be the same as limiting yourself to only pulling the trigger three-quarters of the way (74% to be exact). For even greater flexibility, you can set an input on your transmitter to adjust max power, allowing you to essentially ‘motor-up’ or ‘motor-down’ mid-race without having to change your motor. 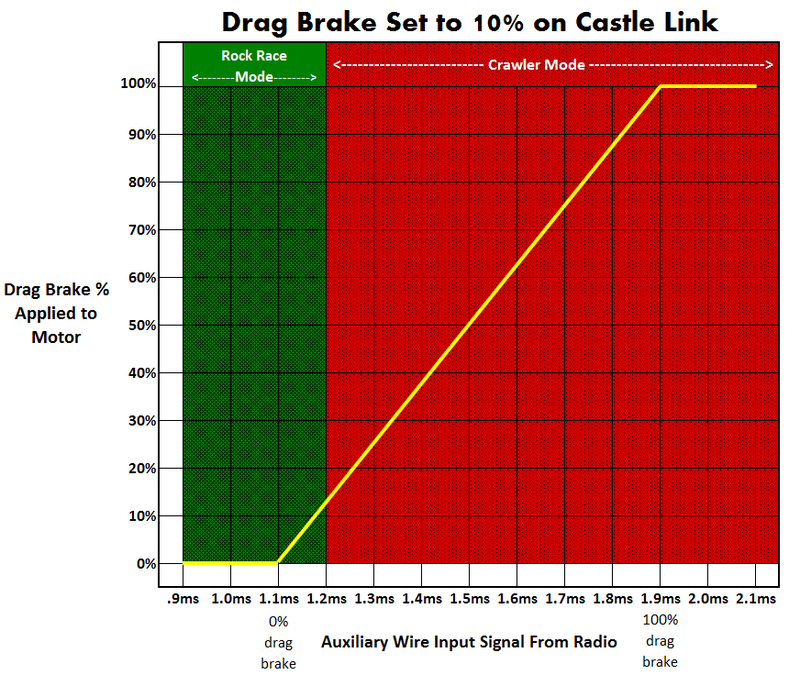 Use the AUX wire with your Castle X-Series Controller, and assign the ‘Auxiliary Wire Mode’ to ‘Max Throttle Adjustment’ in Castle Link. Use Castle Link to set the ‘Max Forward Power’ setting in the ‘Power’ tab.